We are noticing a trend in our wedding cakes lately. Personal details, taken from the wedding invitation, are cropping up on our wedding cakes. 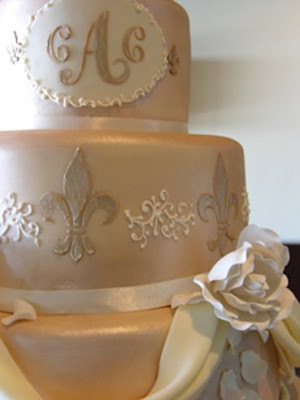 In this wedding the invitation had fleur de lis, which we added to the design of the wedding cake. 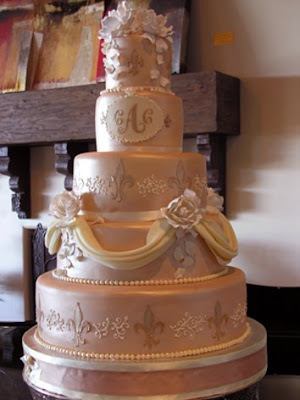 This wedding cake looks amazing and the details are excellent, very creative. It looks almost too good to eat! Wow, amazing work. I love that even the design aspects of the cakes are three-dimensional, with bits and pieces curling up off the Wedding Cakes.